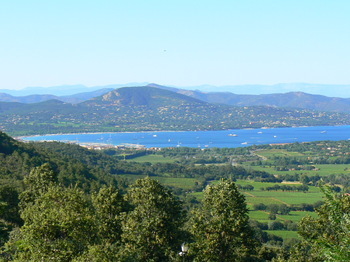 We decided this would be our last chance to get over to Saint-Tropez before the swarms of tourists arrive for the months of July and August. It was already too late to get a room at the Hotel Le Mouillage, which we really liked when we stayed there this past April. 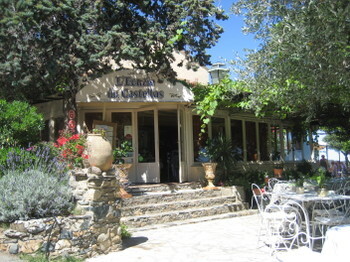 In April we had arrived on a Saturday, in time for lunch at Club 55 on the beautiful Pampelonne beach. The only problem was that it was pouring down rain … and the rain never stopped the whole weekend. Four of our friends had planned to meet us the following morning to do a hike that we had talked about doing for a really long time. But it never stopped raining, so they all canceled out, and we decided to head home a day earlier than we had planned. So, this weekend we returned to do the hike that we missed out on in April. 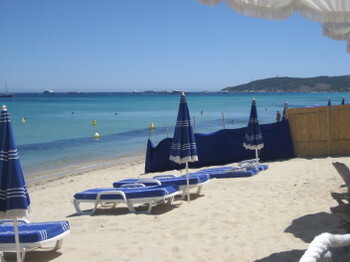 And the weather was perfect, as we started out with lunch on the beautiful white sand of Pampelonne beach once again. 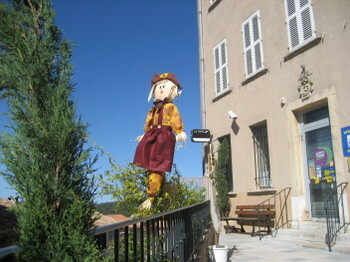 On our way to our hotel in the village of Ramatuelle, we passed by a number of wineries here in the Var, where one particularly got our attention. 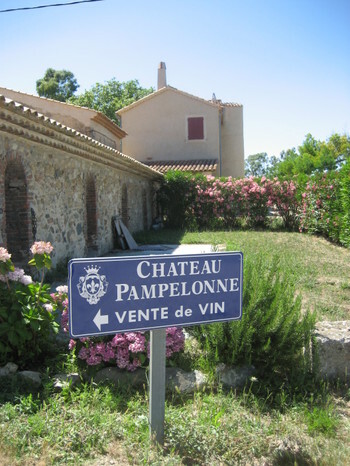 We had just finished off a half bottle of a crisp and fruity rosé from Chateau Pampelonne with our lunch, and we couldn’t resist stopping in to get a few bottles to take home with us, now that we are headed into the rosé season. 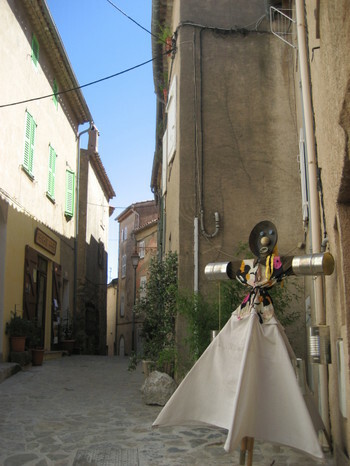 Saint-Tropez was all booked up, but we were lucky to get a room at the charming L’Ecurie du Castellas in the nearby village of Ramatuelle, which turned out to be a great location for our impending hike tomorrow. 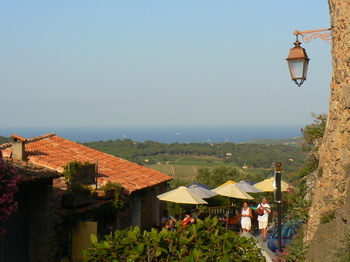 We were happy with our room overlooking the Bay of Pampelonne in the distance, and the village itself was colorful and picturesque, sitting up on a base of rocky granite, with plenty of inviting terrace cafés and restaurants scattered around. 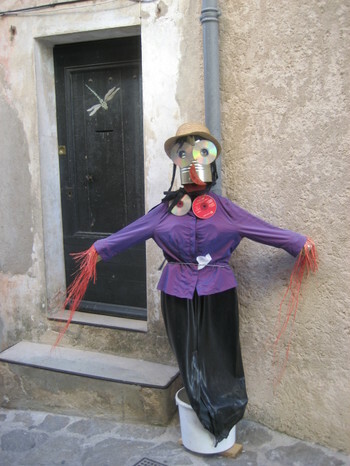 The narrow streets and alleys of Ramatuelle were invaded by épouvantails (scarecrows), from the Expo Nature & Épouvantail held each month of June. They guide the way along a botanical circuit with descriptions and information of the local flora. 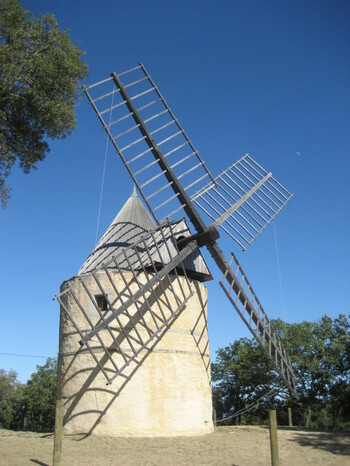 We took a short drive along the Route du Moulin de Paillas, where the ancient, but newly-restored (2002) windmill sits at the summit of Ramatuelle, to the village of Gassin with its lovely views over vineyards toward the sea and the hills. It’s too bad we couldn’t fit in two dinners tonight because the terrace restaurants here in Gassin looked lively and extremely inviting also. But, I think we chose wisely for restaurants tonight. 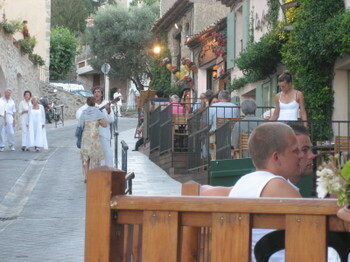 La Forge (rue Victor Léon, tél: 04.94.79.25.56) in Ramatuelle had excellent food that matched its animated alfresco setting. Sounds like a very fun trip! !